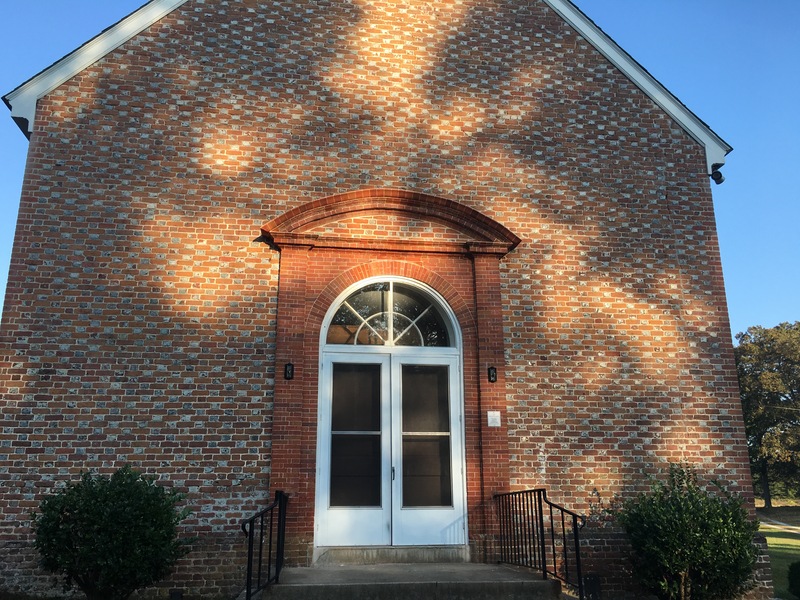 View of the entrance to Mattaponi Church. Note the Flemish bond glazed headers, still prominent after almost 300 years. 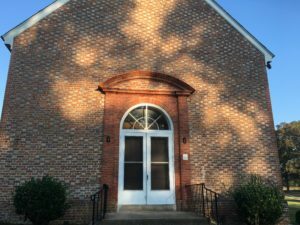 KING AND QUEEN COUNTY – Mattaponi Church hardly looks like the typical rural historic Southern Baptist church. The cruciform-shaped church, with a glazed-blue Flemish bond brickwork pattern, is instead a high-style relic of the time when church was state, and George II, the last non-British British monarch, was Defender of the Faith. More stylish and polished than even Bruton Parish in Williamsburg, it sits in the almost disappeared unincorporated village of Cumnor in the depopulated (and in some eras impoverished) Middle Peninsula county of King & Queen. 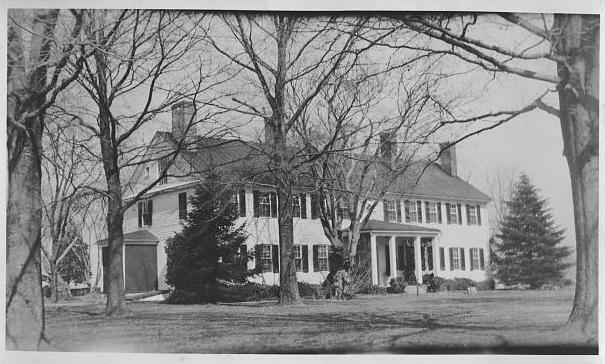 Here, Rosegill Plantation in Middlesex, in Frances Benjamin Johnston’s famous survey of colonial architecture. There is an unfortunate notion that the elite leaders of colonial Virginia were somehow deists or agnostics, and that they operated in a sort of less-religious universe than Puritans up north. And it is true, of course, that Mayflower folk were leaving Europe for religious freedom, and the Virginia settlers came more for a better life, and often led a life of excess. 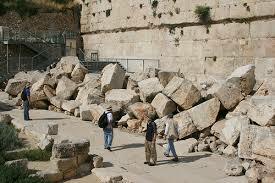 In 2013, my group at the Temple Mount in Jerusalem, where the walls were torn down by the Romans. And then the Lord told him to take it all the way to modern day Iraq, the Euphrates River, and hide it under a rock. He did it. And then he had to dig the sash, which was a priestly garment, and then put it again under a rock in the water. Later the Lord told him to dig it up. BEDMINISTER, N.J. – Whatever your opinion of the recent election, let’s agree on one thing. Yesterday, Donald Trump went to church on Sunday, and that is a good thing. 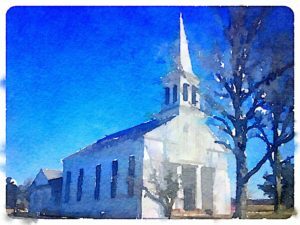 The church was The Lamington Presbyterian Church, a stunningly simple, beautiful neoclassical white church in New Jersey. D iscouragement can be completely destructive for the Christian. It not only hurts us, but it hurts others; when we show our discouragement as a way of life, who else wants to be like us? Who wants to be around a discouraged person? While it’s a real feeling, and true for Christians (and not), it’s a bad feeling. When we wallow in it, it shows us and others that God is not in control. It is a sin. One of the best meditations on controlling discouragement is an online sermon I found from The Rev. Daniel Davey of Colonial Baptist Church of Virginia Beach. I heard it a couple of years ago, and listened to it again this month. It still resonates. Written by Luke, Acts 18 is the story of Paul going to Corinth, and he is struggling in his ministry. In Acts 18, Paul goes there to work in the tent business, and meets up with a Jewish couple named Acquila and Priscilla, who also work in tents. While in Corinth, Paul reasons in the synagogue to win converts, even when he is working in the tent business. LONDON, U.K. – The life story of Richard Branson hinges on many small events, his decision to go into publishing, into launching a record label, his decision to go into the airline business and many others, large and small. One critical moment is often forgotten, about how he got an early, free office from the Church of England. The innovative moved happened at the behest of the Rev. Cuthbert Le Messurier Scott, a naval officer and priest, born in 1913 and Vicar of St John’s, Hyde Park Crescent and St Michael and All Angels, Paddington from 1964-72. Cuthbert is best known for the founding of Horseman’s Sunday, a day of London parish activism where one Sunday in September the Vicar of St. John’s, Hyde Park mounts on horseback outside his church and blesses a cavalcade of up to 100 horses and riders in a celebration of London’s equestrian community. The show began because the stables of f Hyde Park were threatened with closure, and Captain the Rev. Scott came to the rescue. The Rev. Cuthbert Scott also came to the rescue when a young entrepreneur named Richard Branson came knocking in the late 60s to find a home for his magazine Student. Branson describes it thus in his book, Losing My Virginity. The interesting thing is that came because he was not supposed to run a business out of his house, which was rented from the church. We started in a basement in Connaught Square with Student magazine then moved to Albion Street. We then got kicked out by the church commissioners for running a business in a private house. The local vicar, the Reverend Cuthbert Scott, came to our rescue and offered us the crypt of the church at the end of the street. Ironic to be rescued by the vicar. Some take a so called “pure£ version of the church, 0ne that is shut down during the week and opens up on Sunday for services and coffee hour. But the historic parish church of antiquity is a bit of an incubator and encourager of the local business community. Perhaps the most famous of these types of models is The Rev. W.A.R. Goodwin, rector of Bruton Parish Church in Williamsburg who spurred on the redevelopent of the town through his churchly office. The Rev. Scott and his wife Peggie did all sorts of tricks to energize their parish, including inviting George Martin to survey the acoustics, and launching a luxury magazine to promote it. It worked, not only energizing the parish itself, but the community around it. 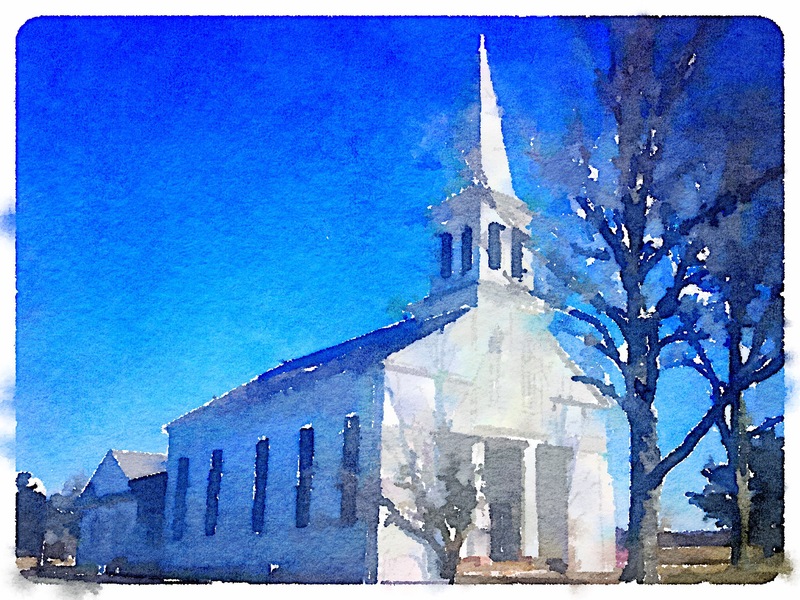 Today, churches have many empty rooms, and many empty pews. What can you do with your empty church? What are we willing to do, as a church, for our youth as they attempt to pursue their dreams? What can we give up or loan from the church that might assist her people? 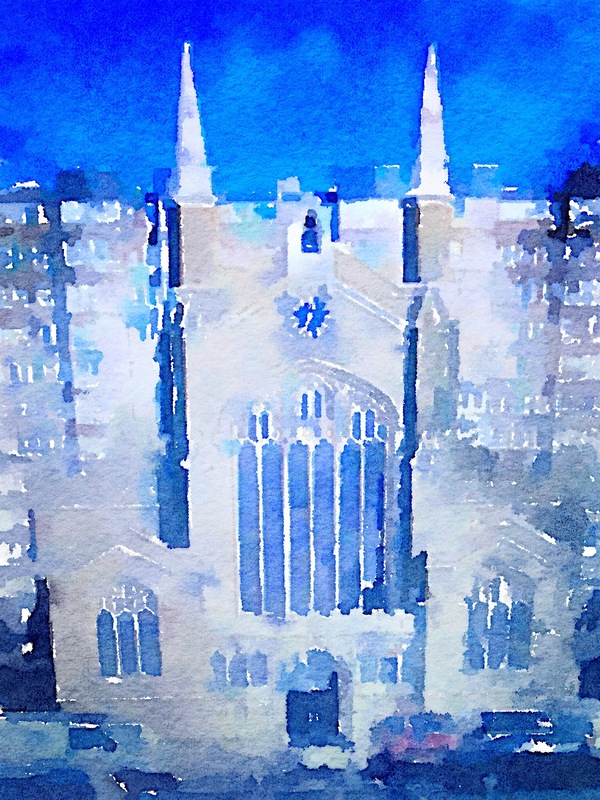 How is church leadership connected to the local community, especially the creative community? Is your church active during the week, and not just with church meetings, but God’s people doing the work of their daily lives? Is all of the real estate in the parish being used for the glory of God and the community? Here, one of my images from the Holy Land. Visit my blog at www.seaofgalilee.org to see other images from the place where Jesus lives. Thus starts one of my favorite passages from the New Testament. I love the second chapter of Luke for all the reasons that I love a good History Channel documentary; it’s about facts and history. For all the legend and lore of Christianity and the reality of parting of seas and Noah’s ark, the central part of Christianity for me is the story of the New Testament, and those truths therein. For if it didn’t happen, it all becomes like some story of the Norse gods — a great tale with a useful message, but not something that you can bet your soul on. Perhaps there was some fellow who cleaned the Aegean stables? Myth makes good advice for living, but world-changing events like the birth of Christ are much more than that. I am not a Biblical scholar, but what I can, as layman, understand is that this story, told over and over again, is recorded and witnessed. I think it important to think of Luke as a historian, and in that context, this all becomes real. It gives it so much more power than just some vague stories in the deserts of Palestine. Frankly, we sometimes turn all these disciples into mythological cartoon figures. But looking at Luke, and this famous passage, it is clear that there were witnesses and he is talking to me, with no atheist in the middle to tell me what I should think about it. Right around Christmastime, there are always documentaries on television and magazines analyzing the facts regarding Christ and the New Testament. And what is always so satisfying is that it all makes some sort of logical sense. This season, there is fellow Episcopalian Jon Meacham, who wrote in Newsweek about the facts of Christ’s birth. But however these reports end, there are always unanswered questions about documents, versions, translations and archaeology. Of course, it is impossible to disprove a negative, and perhaps that is what we always require of skeptics — that they disprove our beliefs. What I love about Luke and the New Testament is that there are many versions of a story by folks who lived in that time or close to that time, and they all say different nuanced versions of the same thing. Look in discussions of the Bible and there are all sorts of debates over when Quinirus lived, who he was, and whether the dates corresponded with Roman calendars. Were there two Quinirus rulers? I think those sorts of discussions all interesting and amusing, but what is often overlooked is that the New Testament is not seen as history, but everything else written in that time is. Certainly, facts are wrong in major history texts, but that does not make us doubt the birth of George Washington? Somehow, we must, as Christians, keep proving that this happened, over and over, in order to accept it. History is always full of nuances and half-truths. Do we hold the rest of history to the same standards we hold the Bible? I think not — with the rest of history, there are many different accounts and many different witnesses. We know from our own lives how people lie and distort for their own ends, but we still accept a lot, as we should. But with the Bible, we seem to hold it to a far higher standard of truth. And perhaps that’s all well and good. For no matter how many times the story is told, and as unlikely as it seems, it all seems to make so much sense, especially thinking about the different versions of it all. 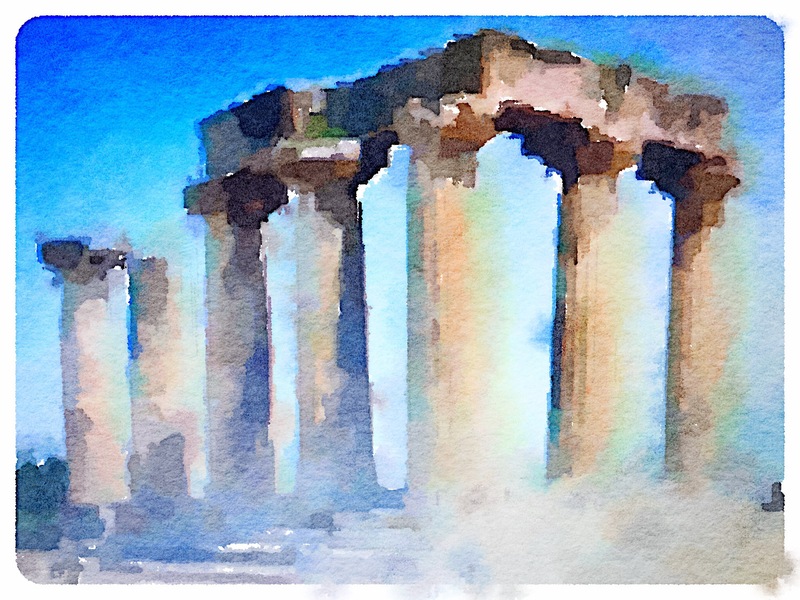 I borrow a thought from the noted Egyptologist John Romer — you can play all you want with the facts, archeological record and manuscripts, and he does. But the evidence of the church and the lives of the disciples and saints that followed is a sort of evidence in itself. And that makes it real.